For most of humanity, public holidays are a breathlessly awaited godsend. But when you work independently, and are living in a new country, they can be an unexpected nuisance. Ach, get up there already. Like today, for instance. I woke up early, intending to get a paper and sit at my favorite café for breakfast. Oh, the plans I had for the day! A haircut, shopping, registering for social security… yes, I’ll need a hearty breakfast for power! On stepping out, it took me awhile to notice how silent the city was. No cars, no businessmen, even the ever-present hippie drug dealer at the corner was absent. And of course, everything was closed. Assumption Day! Assumption Day is a national holiday?! 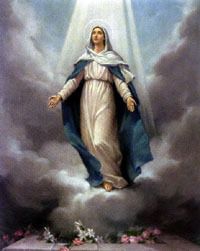 My plans were destroyed, my life sent into utter turmoil, all because Mary had to ascend into heaven. Never again will I be caught off guard! Here is a full list of holidays in Valencia. Be prepared! But note: these dates are for 2008 — some of the holidays (like Easter) might fall on other days in 2009. August 15th – Assumption Day – Lame! Just an observation, and probably something most Christians wonder about at some point in their upbringing: if the Immaculate Conception was December 8th, doesn’t that make Jesus the ultimate preemie?